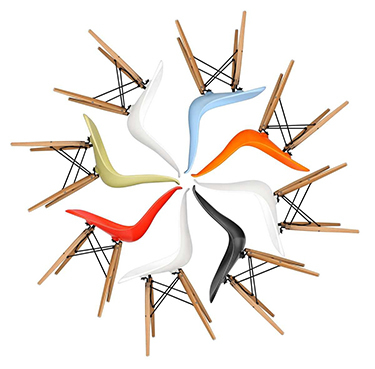 The iconic moulded plastic design of the Charles Eames DAR Chair is instantly recognizable. From its moulded shell with integrated arms to its Eiffel tower-style legs, our STIN furniture version of the Eames DAR Chair is a perfect representation of the original. The shell of the Eames DAR Chair is sculpted to the contours of the body and comes in glossy fibreglass or matt plastic, in a choice of six colours. The legs are constructed from polished stainless steel. Like the original, our plastic version displays round markings on the seat. This is a natural result of the legs meeting the material. Created in 1948, the Charles Eames DAR Chair forms part of a series of moulded plastic chairs designed by the husband and wife team, Charles and Ray Eames. These chairs have the iconic status of being the first industrially manufactured plastic chairs. Each one has the same ergonomically designed seat combined with different bases and arm styles. They are identified by their initials – for example, DAR stands for Dining chair, Armchair with a Rod base. The Charles Eames DAR Chair was made for everyday living. With its deep seat, high back, curved arms and waterfall seat edge; the chairs hug the body making them as comfortable as they are practical. These chairs quickly became bestsellers around the world, and remain as popular to this day. I received my chair quickly after ordering and on the doorstep. I'm so happy for the new chairs and they are quite amazing to sit in. Can only give my warmest recommendations on these chairs :-) only thing I can add is that lacked a couple of cots for the legs, but the ones they sent me away, I drew attention to it. Eames Dar in blue - 6 fabulous color splashes lit up in my living room. The quality is top. We are really happy for our new DAR chairs, however, "fall" for easy backward and becomes a little too high at the front.